Everything is bigger in Texas and Upper Deck has big plans in store for puck fans attending the 2018 NHL Draft™ in Dallas this weekend. The fun will start on Friday, June 22 before the first name is called and continue through Saturday for rounds 2-7. Fans in attendance can see and in some cases meet the next generation of “Young Guns” while enjoying Upper Deck’s memorable promotions. Who will be drafted where? Make sure to check out as history is made! 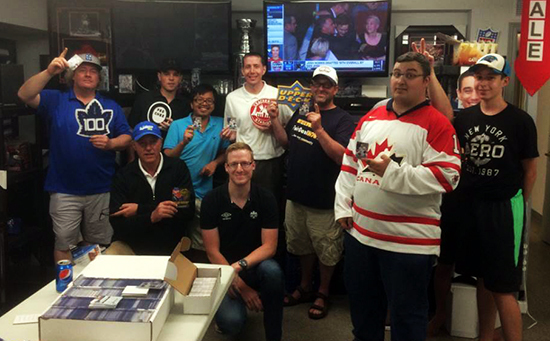 Certified Diamond Dealers – Upper Deck is pleased to co-host two incredible local hobby shops at the 2018 NHL Draft™ in Nick’s Sportscards and Triple Cards and Collectibles. They will be set up adjacent to Upper Deck to provide fans with a bevy of Upper Deck collectibles and supplies. Think of it like a sports card show at the Draft as Upper Deck will provide a variety of fun activities for fans making purchases through them! 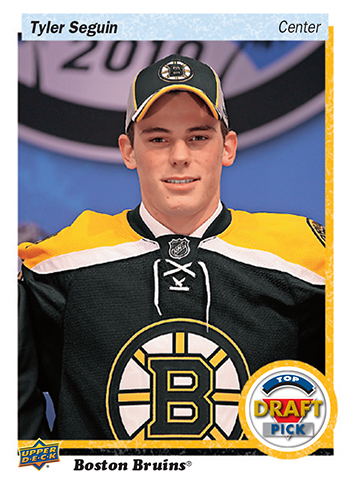 Personalized Upper Deck NHL® Draft Trading Cards – Fans love the opportunity to get their very own Upper Deck trading card made and now that chance comes to the Dallas area. 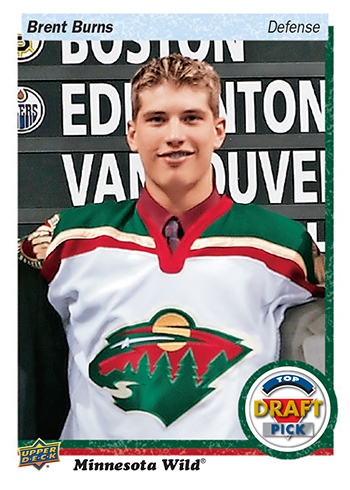 Upper Deck will have professional photographers on-site to shoot fans and then print actual Upper Deck NHL® Draft trading cards for them. 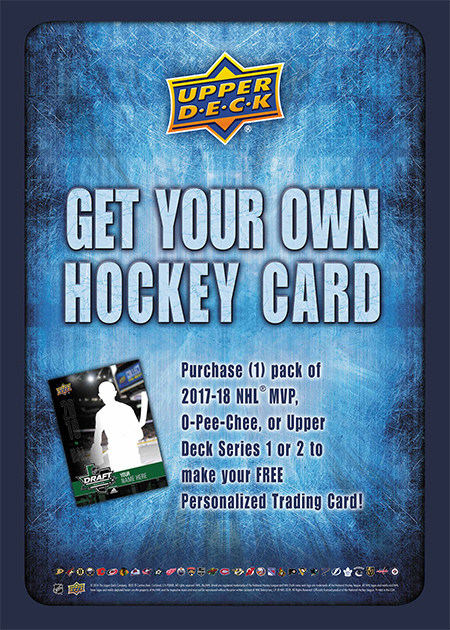 Fans just need to purchase one pack of 2017-18 NHL® MVP, O-Pee-Chee or Upper Deck Series 1 or 2 in order to get their card done. You keep the cards, we’ll take the wrappers and then it’s time for your “photo opp” with Upper Deck to get your personal card made. 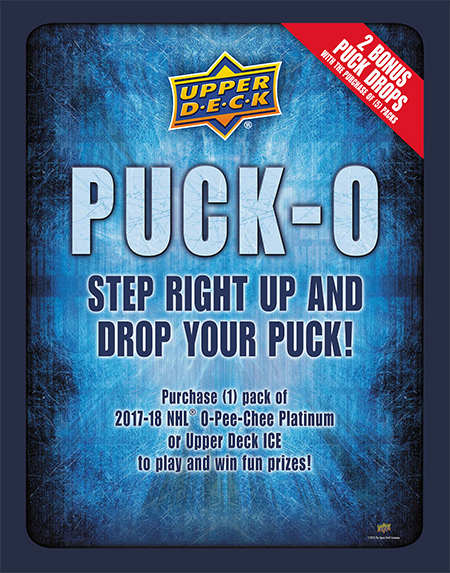 Puck-O Wrapper Redemption – Fans LOVE Upper Deck’s Puck-O program where you get to drop a puck and score a cool prize. Fans can play the Puck-O game by bringing one sealed (1) packs of 2017-18 NHL® O-Pee-Chee Platinum or NHL® Upper Deck ICE to the company’s corporate booth on the main concourse. If you bring five packs, you can score two bonus puck drops. Fans can win cool prizes like 2018 Upper Deck Draft packs, Upper Deck blow-up cards, a special Dallas Draft Poster, memorabilia cards, insert cards, and more! Fans can score this poster featuring some of Dallas’ top stars from the year they were drafted through Puck-O or by signing up for Upper Deck e-Pack. 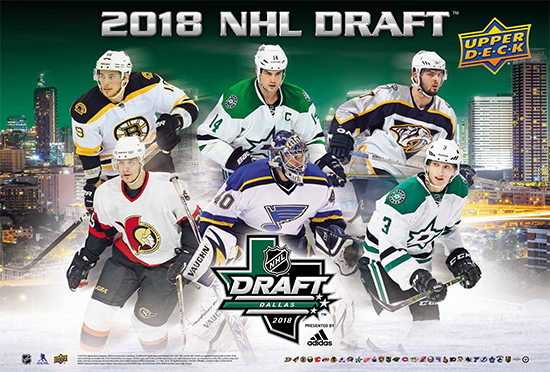 Upper Deck Box Breaker Redemption – Purchase any 2017-18 NHL® Upper Deck hobby box at the 2018 NHL Draft™ and score five (5) 2018 Upper Deck NHL Draft™ packs featuring some of the top draft picks in recent years. This set is the third and final series of this special set! Look for two short-printed cards numbered 49 and 50 featuring Upper Deck spokesmen. 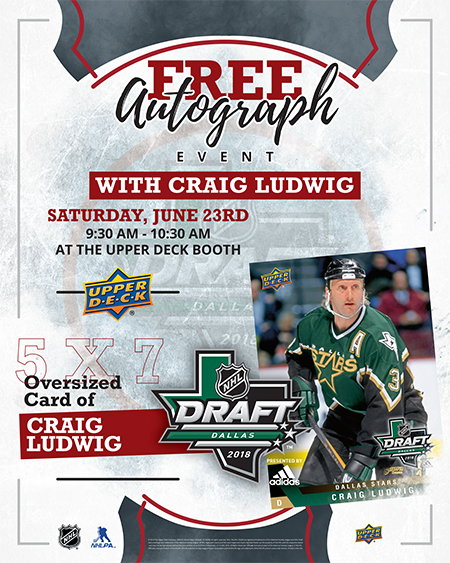 FREE Autograph Signing with Craig Ludwig – He is one of the top 20 Dallas Stars of All-Time and fans have grown to love him in Dallas. Craig Ludwig will be on hand to sign FREE autograph Upper Deck 5×7’s at the Upper Deck booth on Saturday, June 23 from 9:30 a.m. – 10:30 a.m. Behind the scenes the Upper Deck Team will be busy running draft picks through the gauntlet. Have you always wondered what happens after you are drafted? 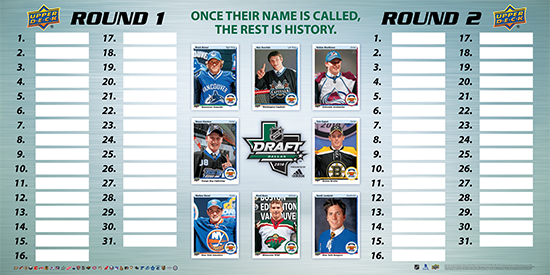 Click here to see a behind-the-scenes look at running the NHL® Draft Gauntlet! 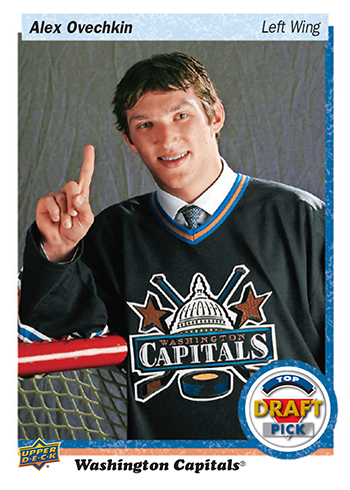 Who knows, maybe some Upper Deck advocates will even get a special shout out from a Draft pick! 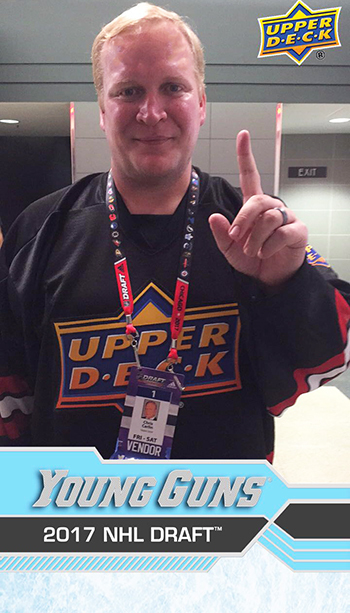 Upper Deck Snapchat Filter – Fans of the popular social media platform will delight in their ability to show themselves on digital Upper Deck cards at the Draft. Here’s a look at a filter from last year. 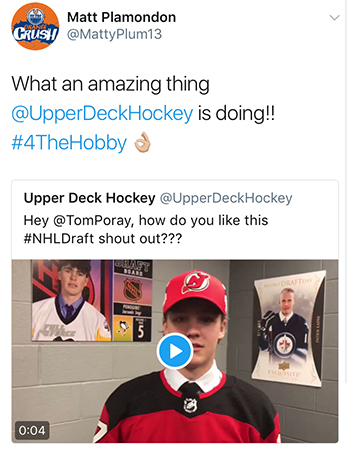 Make sure to be part of the conversation by following Upper Deck on Facebook, Twitter, Snapchat and Instagram in particular and by using the hashtag #NHLDraft. Upper Deck will be watching fun and supportive fans on these platforms and surprising some of them with Mail Days. For fans not in attendance, Upper Deck and Universal Distribution have partnered up to host a variety of Draft parties at shops throughout Canada. Three shops in Buffalo will also be participating as well since they have the #1 Draft Pick. Check out DETAILS ON THESE UPPER DECK DRAFT PARTY EVENTS.